Writing about food is an odd occupation. To get it right, to write a post that really hits the mark, certain things need to line up perfectly. There has to be a decent subject, maybe a recipe that really worked, or a good angle on something or other. There has to be a little spark in my imagination as I pound out the words. There has to be that fleeting fraction of a second where a camera shutter opens and captures something that, at the very least, can be salvaged later in Photoshop. Sometimes all of these things just happen easily, sliding into place as if writing blog posts were the easiest thing in the world, as if this is what I was BORN to do. Other times, getting a post over the line is more of a marathon than a sprint. Sometimes, I stare at a blank screen for an eternity, willing that first line to emerge, blinking from my broken mind. Occasionally, there are posts that just end up in the bin, because I know when I’m defeated. You should see my bin. There’s a whole anti-blog in there. And sometimes, all of that happens at once. Firstly, these little lamb shanks tasted IMMENSE. They were seriously good. They deserve not so much a half-arsed blog post as to be written about for centuries to come as one of the finest tasting meals ever experienced on this earth. They deserve immortalising in stone for future generations to discover and read about. They were that good. On the other hand, they weren’t particularly photogenic, as you can see above, and that led them to teeter on the brink of the Bin of Broken Promises for a considerable length of time as I internally debated breaking The Golden Rule of food blogging – crap photos equals crap post, don’t do it. This was a complex and lengthy debate – great food, stunning recipe, but hey, writer’s block and shocking photo, one of those Saturday evening jobs where I just threw a plate together and snapped away because what I really wanted to do was EAT THE DAMN FOOD. I don’t know whether my decision to go ahead was the right one or the wrong one – feel free to lambast my photography, but promise to make the dish and see if you agree with me about the food. 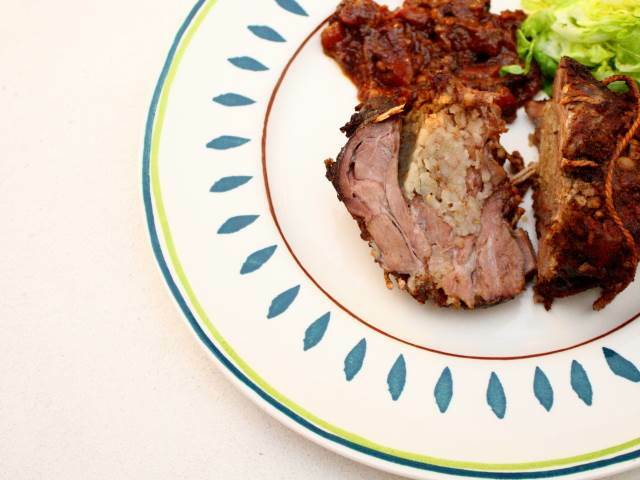 So, an Arabic-inspired lamb dish, stuffed with bulger wheat and slowly, slowly braised in tomatoes and red wine. You see? Sounds excellent already, doesn’t it? Lamb shanks seem a little bit … naff. They were insanely popular a while ago, when every pub in the country that served food was simmering them for hours in red wine and serving them with mashed potatoes. They became a bit of a gastropub-gone-mad joke, but that over-exposure hides the fact that a lamb shank is a perfect, single person portion sized chunk of prime lamb. True, it isn’t a versatile cut – slow roasting or braising only, please, but treat it properly, and it’s one of the lamb’s finest cuts. This recipe calls for the shanks to be stuffed, which means that the bone has got to go. Deboning a shank is fairly easy – just take a small, very sharp knife, and trace down the side of the bone where the flesh is the thinnest and gently cut it away, opening the lamb up like a butterfly’s wing until it’s free of the bone. Cut a deep slash across the thickest part of the meat, on the inside surface. The lamb has a thin membrane on the outside, so it should be obvious and easy to roll it back together into a neat parcel that’s perfect for stuffing. Next, some stuffing. Soak about 150g of bulger wheat in water for about fifteen minutes or so to soften it slightly, then drain completely. Mix the grains with a grated granny smith apple, a tablespoon of sugar, a teaspoon of salt and a teaspoon of ground cinnamon, and stuff this mix deep into the slashes cut across the thick part of the meat … each shank should take a couple of tablespoons, and there’s enough here for about six shanks. Roll each of the shanks up tightly, and tie with butchers’ string to keep everything nicely packed together. Stuffing will spill out of the ends, and I ended up with more on the outside than the inside, but a little trial and error sorted things out. Almost. The sauce, or more accurately, the braising liquid, is nothing more than a generous glass of red wine mixed with a can of chopped tomatoes … but there’s a secret weapon. A lot of Arabic cooking uses blends of spices to add pungency and flavour to dishes, in a similar way that Indian and Pakistani cuisine uses spice mixes like garam masala, and just like garam masala, there’s no set, canonical recipe for any of them. The only commonality is that the list of spices is as long as your arm. This particular blend is seven spices, or maybe eight, if the whim takes you. A coffee grinder reserved for spice grinding is pretty much essential – load it up with two tablespoons of peppercorns, two tablespoons of cumin seeds, a tablespoon of coriander seeds, and a tablespoon of cloves and blitz them to a fine powder, adding a tablespoon of sweet paprika and a teaspoon each of ground cinnamon and grated nutmeg. Finish it off with a tablespoon of ground allspice, if you like, and mix everything together thoroughly. Add a tablespoon of the spice mix to the wine and tomatoes, and season with a teaspoon of salt. To cook, place the lamb parcels in a baking dish, pour the sauce over and around, cover with foil, crimping the edges tightly, and cook in the oven at 190c for an hour, before turning the heat right down to around 110 to 120c for another four hours. This is ‘set and forget’ food. The lamb needs little more attention than an occasional basting with the sauce, and maybe a splash more water if the sauce starts to look like its drying out. Five hours is a long time, but lamb shanks are a tough cut. Serve a lamb shank each with some of the sauce spooned over it, with Arabic bread and a simple salad. Nothing more. I use Ras-el-hanout spice mix from Spicy Monkey. Good stuff, and he’s a nice bloke. Well I’m convinced. Will tweet you when I’ve made them – will blame you if it all goes awry. very nice indeed. And I love your intro about failed posts – I spent a whole sunday doing some IPA marinated pork belly the other week, only to find…well, it was garbage. Still, that’s life, I guess! I’ve stuffed lamb with Cous Cous and Black Pudding before – that was good. Sweet. I’ll be giving this a try. Cheers dude….